Astola is the only site along 1,000 kilometres Pakistan coast where Hawksbill turtles have been sighted. Dolphins and to a lesser extent, whales have also been reported. In fact, in December 1994, a large whale (possibly sperm whale) skeleton washed up on the shores of Ganz, Balochistan. The bones of the whale are on display in Gwadar town. Astola is also rich in corals, oysters and important commercial fishes. Isolated island such as Astola, which has been cut off from the mainland for ages, supports endemic life forms. One such endemic species, Echis carinatus astoli, a sub-species of saw scaled vipor was discovered by a German scientist who took a specimen back with him for display at the Senckenberg Museum in Germany. If a detailed study is carried out, it is likely that many other types of sub-specie of small mammals, reptiles, plants, and shrubs could be discovered. No detailed surveys have been undertaken in the area as yet, so there is a lack of count data for the important species. A short walk through the Island‚ a nesting site for many seabird species is most intriguing. Without the usual predators‚ fearless birds have been nesting on the ground‚ or on branches at eye level. Only a few visitors the Island attracts are able to come within centimetres of magpie robins‚ tropic birds or noddy terns staring straight back at you. Sadly, the sea-bird population has dropped over the years, as a result of increased numbers of feral cats which feed on the eggs and disrupt the nesting and breeding sites. Astola is used as a base for fishermen who frequent the Island between September and May to catch fish in general and lobster and oysters in particular. Between June and August, the Island remains free from human interference due to rough sea and high tides. On finding a small Island ideal, the fishermen decided to bring their cats along in order to rid it of its resident vermin. What they do not realise is that by doing this, they trigger a change of events that leads to destructive changes in the Island's habitat. A few fishermen and their pet cats on a trip to Astola unwittingly can almost destroy this unique ecosystem. An NGO concerned with conservation of nature plans to initiate an awareness raising programme in Astola Island as a first step towards a community-based conservation programme to reverse the degradation of the Island's biodiversity. Astola requires urgent conservation efforts, may be at government level, as the natural ecology is being damaged due to the introduction of feral cats. About 25 kilometres south of Balochistan coast, Astola is six kilometres in length and administratively comes under Pasni subdivision of Gwadar district. According to the Balochistan Gazetteer, printed in the beginning of the 20th century, the island - known as 'Satadip' among Hindus - was held in extreme reverence by the Hindus and pilgrims from all parts of the Subcontinent venerated in increasing numbers. It is said that goats were taken to the Island for sacrifice; only the blood was spilt at the shrine of Kali Devi while the flesh and entrails were thrown out to the sea. Even now the Island has an aura of mystery. There are architectural remains of an ancient temple of the Hindu goddess Kali Devi. A prayeryard has been constructed in the memory of a Muslim saint associated with oceans. A small solar operated light tower has been installed on the top of one of the Island's cliffs for the safety of passing vessels. Locals have given it the name Haft Talar meaning seven rocks but the Island appears to form a single block with an estimated height of two hundred feet at its summit. An isolated rocky area has broken away from the main block towards the south end. Given that the Island is not sheltered from the open sea, it is subject to strong wave attack during the southwest monsoons, when wave height exceeds 3.5 metres. The coastline therefore suffers from severe erosion. Astola is one of the biggest offshore islands in the Arabian Sea. Possessing a unique habitat, it was identified as part of a Global 2000 eco-region. It is the only significant offshore island along the north coast of the Arabian Sea, and as such maintains the genetic and ecological diversity of the area. But irony is that presently it does not merit even a dot on most Pakistan maps. It would be worthwhile to study Astola Island's leeward side as an offshore (oil or even for liquefied gas) embarkation platform in the extreme north end of the Arabian Sea. 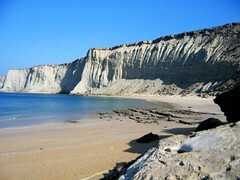 As the largest Island of Pakistan, Astola has a considerable potential for being developed into an eco-tourism site where both local and foreign nature enthusiasts can visit and behold rich flora and fauna of the Island, as well as witness the flourishing marine life in the clear waters through glass-bottomed boats. The communities living on the mainland would benefit by providing services to the eco-tourists as an alternative income generating venture. Currently there is no recreational and or tourism activity on site for which it has potentials. The post sent me a decade back when we sailed around Astola in a ship. Pakistan has an amazing variety that is unknown to most Pakistani's themselves what to talk of foreigners.